Do you have a physical or telemedicine practice, store, studio, gym, spa, club, or venue where people come who are looking for ways to improve their quality of life? If so, carrying CleanMed CBD might be a great option for you. 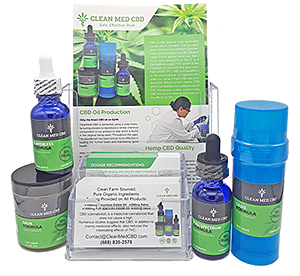 CleanMed CBD offers top quality products, competitive pricing, great markup, low minimum orders, and white labeling services. Our users come back for more because our product works, and that means repeat business for you. Offer the best CBD on the market to your clients or patients. Sign up for a wholesale account today. Low 5 bottle minimum order. White Labeling Available. Click here for details. Wholesale accounts come with the display materials free of charge upon request. Please fill out and sign the form below. After submitting, check your email for confirmation and link to create your own wholesale account.